Robert Gibbs, ASLA, president of Gibbs Planning Group, will be honored by the Clinton Presidential Library School of Public Service on October 15. 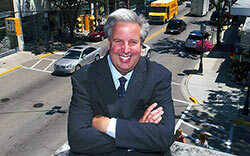 He will speak as a William J. Clinton Distinguished Lecturer on “How Great Communities are Conceived and Built”, a topic derived from his new book, Principles for Urban Retail Planning and Development. The Southfield City Centre Advisory Board commissioned Gibbs Planning Group to conduct a Retail and Hotel Market Analysis earlier this year. The results showed that the Southfield City Centre District can support an additional 645,000 square feet of retail and restaurant development, generating up to an additional $240.7 million in gross sales revenue, growing to $252 million by 2016.